The Milwaukee Bucks plan to bring back three coaching candidates for second interviews this week. According to the Milwaukee Journal Sentinel, Lakers assistant Steve Clifford will meet with Bucks GM John Hammond tomorrow. Atlanta coach Larry Drew and Houston assistant Kelvin Sampson are scheduled to be back in Milwaukee on Wednesday. 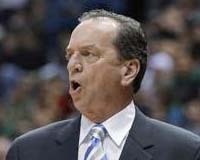 The Bucks fired interim coach Jim Boylan at the end of the season. While the Milwaukee Bucks search for the teams next head coach, another team has joined the mix, looking to fill a vacancy. The Brooklyn Nets are looking for a new head coach after letting interim coach P.J. Carlisimo know that he would not be returning after a 49-33 record. The Nets were eliminated from post season play in game 7 of their first round series with Chicago. 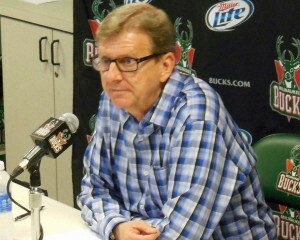 The Bucks are still looking for Jim Boylan’s replacement but say they won’t be rushed. At least five teams, including the Bucks, are now low looking for a new head coach. Philadelphia, Charlotte and Detroit. Yet the teams General Manager, John Hammond said they are not in a hurry to hire the teams 13th head coach in franchise history. decision was made after General Manager John Hammond met with Boylan this morning at the Bucks Training Center in St. Francis, Wis.
Boylan compiled a 22-28 record (.440) after replacing Scott Skiles as head coach on Jan. 8. The Bucks were swept by Miami in the first round of the 2013 NBA Playoffs, 4-0. 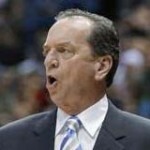 The 58-year-old Boylan had been the lead assistant coach for the Bucks the past four seasons, joining the team after finishing the final 56 games (24-32, .429) of the 2007-08 season as the interim head coach of the Chicago Bulls. His NBA coaching career began in 1992 with Cleveland. He also served as an assistant with Vancouver, Phoenix, Atlanta and Chicago. As expected, the Milwaukee Bucks post-season last just 4-games. The defending NBA Champion Miami Heat pulled off the 4-game sweep with an 88-77 win on Sunday at the Bradley Center. Miami won all four games in the series by double digits and hardly broke a sweat. The Heat pulled out a playoff sweep for the first time with LeBron James, Dwyane Wade and Chris Bosh. James scored 30 points, pulled down 8 rebounds and dished out 7 assists in the win. Milwaukee Bucks point guard Brandon Jennings injured his foot in the final regular season game at Oklahoma City, but coach Jim Boylan says it won’t cause him to miss any time in the upcoming NBA playoffs. Boylan said the Bucks are healthy and ready for Sunday night’s Eastern Conference playoff opener against the Miami Heat in Miami. Forwards Larry Sanders and Ersan Ilyasova will be ready to go against the Heat. Neither played in the season finale against Oklahoma City. The Bucks beat Miami 104-85 on December 29th, their only win against the Heat this season. The Bucks finished the regular season 6-games below .500.
ready for the playoffs. Watching the Milwaukee Bucks play and you’d have to wonder just what their agenda is all about. Poor defense, sloppy offense, turnovers, you name it. They all led to the Bucks 107-98 home court loss to the Minnesota Timberwolves. Minnesota has nothing to play for, yet they were playing like you’d like to see the Bucks playing down the stretch. Wins have been hard to come by lately for the Milwaukee Bucks. Entering Thursday night on a four-game slide and losers of 7 of their last 9, Milwaukee was able to put together a 113-103 victory over the L.A Lakers at the BMO Harris Bradley Center. Kobe Bryant led all scorers with 30 for the Lakers. Milwaukee now sits 35-36 with a magic number of four (wins and 76er loses) to get to the post season. The Bucks are also back within 2-games of the Boston Celtics for the 7th spot in the Eastern Conference. Oklahoma City is up next for Milwaukee as the Thunder visit Saturday night for a 7:30 tip. Three teams in front of the Milwaukee Bucks in the Eastern Conference standings lost on Tuesday night. The Bucks failed to take advantage themselves, falling to the Dallas Mavericks 115-108 at the BMO Harris Bradley Center. Monta Ellis had 32 points and 9 assists to lead the Bucks. Mike Dunleavy added 18 and J.J. Redick 17 for the Bucks (32-30), who lost for just the second time in the last eight games. Dallas (30-33) won its season high fourth straight game. Vince Carter hit three big 3-pointers in the 4th quarter to help keep the Bucks in check. He finished with 23 to lead the Mavericks. The Bucks hit the road tonight to face the Washington Wizards. They’ll return to Milwaukee to host red-hot Miami on Friday night. Bucks fall to Nets, again! It was one thing for the Milwaukee Bucks to fall in overtime on Tuesday night in Brooklyn, but to return to the BMO Harris Bradley Center and lose to the Nets again last night is a major disappointment. The Bucks controlled play for the first three-quarters and led by 8-points after three-quarters. They then proceeded to his just 2 of their first 17 shots in the 4th quarter and fell to the Nets 97-94.